Invisalign is a modern esthetic orthodontic technique that can straighten your teeth without the metal and wires of traditional braces. Instead Invisalign uses a series of clear removable aligners that gradually straighten your teeth. 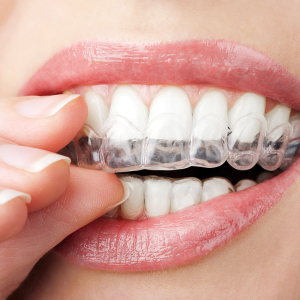 If Invisalign is a good treatment option for you, we will take detailed impressions to make 3D models of your teeth. Using these models, we are able to dictate the position of your teeth and the way your teeth will move with each successive aligner you wear. We can even show you the virtual results that you will see when you are done with treatment! Invisalign is an orthodontic technique and not an orthodontic product. It should not be a cookie-cutter treatment option. To ensure that your orthodontic treatment with Invisalign produces the results we want, Dr. Sirena dictates how teeth move in terms of speed, order, and direction. You will wear each set of aligners for one to two weeks. Each successive set of aligners you wear will fit your teeth slightly differently from the previous one to gradually straighten your teeth. Just like regular braces that place pressure on the teeth all the time, Invisalign must be worn for as close to full-time as possible. The general rule is for 22 hours every single day, allowing two hours for brushing, flossing, and eating. The total treatment time with Invisalign averages between 5 and 15 months, and the average number of aligners worn during treatment is between 10 and 48. For the most efficient treatment time, patients should wear their aligners for 20 – 22 hours every day, every single day. During your initial complimentary Invisalign consultation, Dr. Sirena will explain in detail how Invisalign will work for your individual case.